The 1936 baseball season marked the beginning of a four-year World Series winning streak for the New York Yankees. Hall of Famers Lou Gehrig, Bob Feller, and Joe DiMaggio contributed to this exciting year. Find highlights from the 1936 baseball season below. The Yankees take the American League flag by 191/2 games, a loop record. The Giants win in the National League. The Yankees take the first Subway Series since 1923 in six games. Yankee Jake Powell is the 1936 World Series hitting star at .455 with five RBI. In game two, the Yanks score a Series record 18 runs. 11 runs in one game. On May 24, Yankee Tony Lazzeri drives in an American League record 11 runs in a game. Lou Gehrig is the 1936 American League MVP. Carl Hubbell wins his second National League MVP Award. Chicago's Luke Appling wins the American League bat crown with .388 BA, highest in this century by a shortstop. 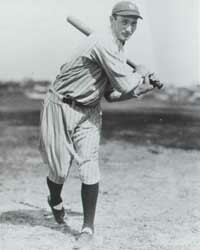 Paul Waner wins his last National League bat crown (.373). Gehrig leads the majors in homers (49). runs (167), OBP (.478), SA (.696), walks (130), and runs produced (270). The Hall of Fame is created; in the first vote for enshrinement, the leading vote-getter is Ty Cobb. Babe Ruth, Honus Wagner, Christy Mathewson, and Walter Johnson join Cobb as the first Hall electees. Hubbell wins a record 24 straight games over a two-year period. Hubbell's 26 wins top the majors. Ducky Medwick cracks a National League record 64 doubles. Cleveland's Hal Trosky leads the major league in total bases (405) and RBI (162). Trosky's 42 homers set a new Cleveland club record. The Yankees have a record five men with 100 or more RBI. The Phils commit 252 errors and are the last major league team to top 250 in a year. On Sept. 23, 17-year-old Indian Bob Feller sets a new American League record (since broken) when he Ks 17 batters in a game. Hank Greenberg breaks his arm in April, shelving him for the season and sinking the Tigers' chances. Gehrig hits 14 homers vs. Cleveland, a record vs. one team in a season. On April 14, Cardinal Eddie Morgan becomes the first player to hit a pinch homer in his first major league at-bat. Ed Coleman of the Browns sets a new American League record with 20 pinch hits (since broken). Pirate Woody Jensen's 696 at-bats are a record for a 154-game schedule. Joe DiMaggio scores 132 runs, an American League rookie record. Chuck Klein, back with the Phils, hits four homers in a ten-inning game on July 10. We have even more highlights from the 1936 baseball season on the next page.